That headline sound confusing? Of course not, because we’re talking about Justin Warner, Food Network’s newest Rebel With a Culinary Cause. And what’s more rebellious/culinary than a rapping pope spitting dope rhymes about Chateauneuf de Pape? Nothing. Back in 2010, Eatocracy caught up with Justin at the Food & Wine Classic in Aspen, when he was still working at The Modern in New York City. 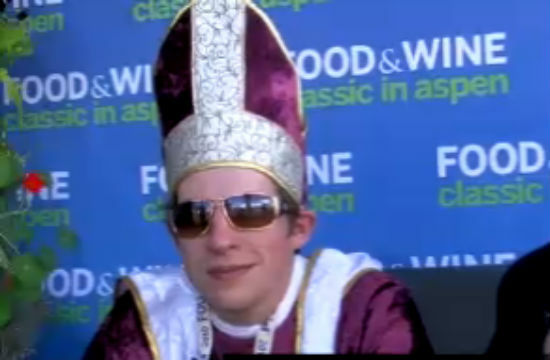 He was dressed as the pope, talking up that year’s Chateauneuf de Pape when a rap battle ensued between him and some dude hawking Riesling. Except there was no battle. There was only Justin’s rap, and the other guy puttering on about how Riesling only needed one edification, as opposed to the 13 used to blend the 2009 Chateauneuf de Pape. Uh, we think it’s pretty safe to determine who the winner was. We are feeling a little light-headed. Excuse us.